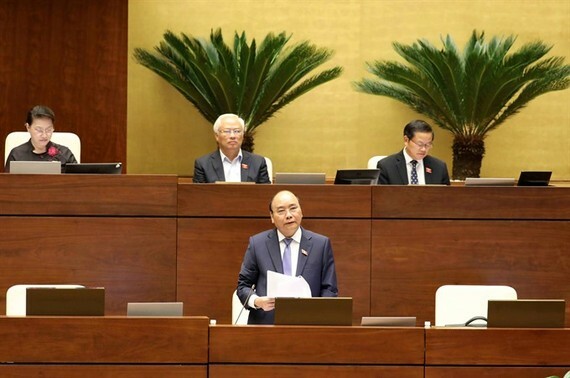 The Government will accord priority to a ‘reasonable’ distribution of wealth as it tackles the various socio-economic disparities in the country, Prime Minister Nguyen Xuan Phuc said on Saturday. Equality, growth quality and the handling of high-profile corruption cases were leading concerns as he fielded questions in parliament on Saturday afternoon. He was the last Government leader to take the floor at the National Assembly’s three-day hearings of cabinet members. The 2.5 hour long Q&A session was the second time PM Phuc took questions. For the most part, his performance on major national issues was positively reviewed and received by deputies and voters, the Vietnam News Agency reported. Opening the session, PM Phuc reported on socio-economic achievements of 2017, especially stressing the fulfillment of 13 targets set by the NA last year. Phuc asserted that the country’s growth quality has improved visibly, with industry contributing more than agriculture. He said that this year’s export turnover could reach US$210 billion, up 21 per cent compared to last year (and threefold the set target of 7 percent). The country has jumped five positions on the global competitiveness index and made progress on other human development indexes including life expectancy, which reached 73.7 years, the PM noted. On administrative reforms, Phuc said the government has introduced a total of 14 resolutions and implemented several measures. Citing examples, he said the process of abolishing household registration books and issuing individual identification numbers has begun, and online portals set up to receive feedback from people and businesses. “From 2015, the number of civil servants on government payroll has been reduced by 30,000,” he said, adding that from now towards 2021, the aim is to shrink the number of government workers by 2.5 percent each year. Responding to questions over the wealth disparity, including social stratification between rural and urban areas, and mountainous areas and flatlands, Phuc admitted that despite the government’s efforts and recent achievements, there remained big development gaps between these areas, with rural income just half of that in urban areas, and even lower in mountainous areas. “A reasonable distribution of wealth is an ongoing priority,” and will be promoted in the coming time via economic restructuring, improving labour productivity and product quality, creating more jobs for people in remote areas, redistribution of income by taxation, and better social security, he said. On promoting the private sector’s role in the economy, PM Phuc said that the country can expect to have more than 115,000 new private companies this year and 93 percent operating well. He also reiterated the government’s commitment to improving the trade/business environment, increasing transparency and equality in accessing resources, streamlining procedures, and preventing overlapping inspections. Phuc asked private sector companies to “say no to bribes and unofficial fees”. 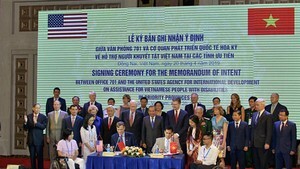 Responding to concerns over the management of foreign direct investment (FDI) businesses, PM Phuc said they are “a part of Vietnam’s economy” that contributes 60 percent of the country’s export value and employs 3 million people. But there were issues with this sector, including the level of technology used, pricing, tax evasion and violations of environmental regulations violations. These will be dealt with strictly, the PM said, adding the Government will be choosy about attracting investment. Investment will be directed to areas where there was real need, “not in just any area, and by whatever means,” he added. He said FDI and domestic firms should co-operate better for a win-win development. The Prime Minister strongly affirmed that “the Party and the State will not allow outrageous high-profile corruption cases to fall flat,” and that the judiciary and legislative branches will collaborate to deliver rightful results to the public. Some deputies expressed their appreciation for the government’s recent strong anti-corruption push, but also voiced concerns over “new and more sophisticated and deep-lying forms of corruption” that can undermine the political system. He also asked the NA to consider raising wages for civil servants as a way to ensure their livelihood and reduce petty corruption. “The application of information technology solutions can be helpful in preventing corruption,” he said, asking local governments to promote this process in the coming time, together with implementation of e-government. When asked, the government leader admitted he was not entirely satisfied with the achievements in governing the country. He also said his “worst fears” are backwardness, corruption, peaceful evolution, and moral failings. Phuc also responded to other issues raised at the hearing, including functions of a facilitating government, policies for ethnic minority people, equitisation of State-owned enterprises, measures to better protect forests, and civil servants’ bureaucratic attitude.